The Prime Minister went on the offensive as thousands of protestors gathered in three cities. TURKEY’S DEFIANT PRIME Minister Recep Tayyip Erdogan has told supporters his patience “has a limit” as he went on the offensive against mass protests to his Islamic-rooted government’s decade-long rule. As thousands of protesters massed in Istanbul, the capital Ankara and the western city of Izmir, in unrest now in its 10th day, Erdogan staged his own rallies, hitting three cities in one day to fire up loyalists of his ruling Justice and Development Party (AKP). “We remained patient, we are still patient but there’s a limit to our patience,” Erdogan told thousands of cheering AKP supporters as he landed at Ankara’s airport today. Nobody should be pessimistic. Nobody should worry. Turkey went through many events in the past and will overcome this too. His fans relished the show of strength, frequently interrupting the outdoor speech with bursts of applause and chanting: “Turkey is proud of you”. At the same time, thousands of rival anti-government demonstrators thronged the capital’s Kizilay square, where police used tear gas and jets of water to disperse demonstrators overnight, sending them scrambling and tripping over each other. The unrest first erupted on May 31 with a tough police crackdown on a campaign to save Istanbul’s Gezi Park from demolition. The trouble spiralled into nationwide protests against Erdogan and his party, seen as increasingly authoritarian. Erdogan on Sunday maintained his tough line against the protesters, dismissing them as “anarchists” and “terrorists”. “The youth that curses its prime minister cannot be my youth,” he said earlier in the southern port of Mersin, at a sports centre packed with tens of thousands of flag-waving AKP loyalists. “If you care about democracy, this prime minister is at your disposal,” he added. Adana also saw violence overnight, with police dousing demonstrators with tear gas. The government insisted yesterday that the protests were “under control”, but hours later some of the largest crowds yet packed Istanbul’s Taksim Square, the epicentre of the demos, with people peacefully singing and dancing through the night. Taksim has seen no police presence since officers pulled out last weekend. In a fresh bid to calm the turmoil, the man who ordered the initial police crackdown, the governor of Istanbul Huseyin Avni Mutlu, apologised on Twitter and said he wished he was with the protesters camping out on Taksim Square. I salute the young people of this country who chose to sleep on the square under the stars instead of in their warm beds. Deputy Prime Minister Huseyin Celik on Saturday dismissed any talk of calling early elections to resolve the crisis. “You don’t decide on early elections because people are marching on the streets,” he told reporters in Istanbul. 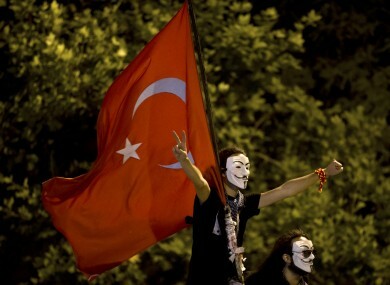 Email “Turkey PM Erdogan warns patience 'has limit' as protests flare”. Feedback on “Turkey PM Erdogan warns patience 'has limit' as protests flare”.